Joseph Paquette, a proud Metis, was born in Kapuskasing (Cree Territory), located in Northern Ontario. In the late-60's, Joe served with the Queen's Own Rifles of Canada first Battalion, and was stationed at Workpoint Barracks, CFB Esquimalt,in Victoria, BC. He also served with the Lincoln and Welland Regiment as a Reservist prior to Reg. Force. From 2008 to 2010, he was a Councilor/Veteran with the Credit River Metis Council. During that time he participated in the subcommittee for the Maanjidowin gathering in Mississauga which showcased the Metis, First Nations and Inuit. The gathering saw over 10,000 visitors over the two day gathering. Joe strives to establish good relations with local Heritage organizations, Aboriginal Veterans organizations and promotes the Métis way of life. 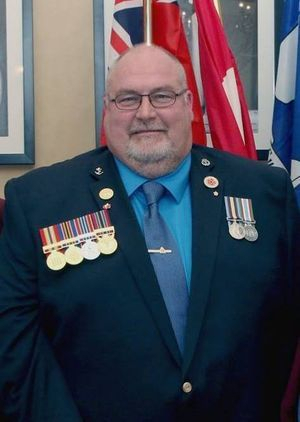 Since 2009, Joe has served as secretary for the MNOVC and was instrumental in maintaining/updating the Veterans data base, Veteran registrations, Metis Veterans Wreath and the updating of Veterans Community Charter. In 2011, Joe established the MNOVC website to better service our MNO Veterans throughout Ontario. Joe sits on several committees from local Education establishments to Faith Leaders group. He has participated in cultural presentations for the past 25 years and continues to be active locally. As a hunter/fisher, he enjoys the outdoors and is involved in the gathering, processing and teaching of indigenous plants. Joe has earned the Lifetime Achievement award from the Ontario Heritage Trust 2008, and received a lifetime membership from the Mississauga Heritage Foundation and still continues to research on Metis history in Ontario. He was awarded the Minister of Veterans Affairs Commendation and the Lieutenant Governor's Ontario Heritage Award for Lifetime Achievement. Joe also participates in local, provincial and National events and promotes our cherished Veterans. Joe is married to Pam, his spouse of 40 years and resides in Mississauga. Joe is serving his second term as acclaimed president of the MNOVC in the 2016 election. At the 2016 AGA, Joe was awarded the MNO Suzanne Rochon-Burnett Volunteer of the Year award. Guy Mandeville, C.D., born in Timmins, Ontario (raised in Connaught, Ontario). Guy joined the Canadian Army in June 1967 and served with the Royal Canadian Regiment for nine (9) years and then transferred to the Canadian Forces Postal Service until his retirement from the Canadian Army in September of 2009 after 42 years of service. Guy has done service in Germany, Alert, NT, Cyprus, Egypt, Golan Heights, former Yugoslavia (Croatia), Rwanda and East Timor. Guy has earned three bars to the Canadian Decoration (CD). Presently Guy is involved with the local high schools doing First Nations, Metis and Inuit presentations on a weekly basis; education is an important aspect of his presentations. Also Guy has been involved with Scouts Canada since 1969 in various positions; he is also a member of the Trenton Lions Club and does various service events with the club. Guy is an active member of the Defense Aboriginal Advisory Group (DAAG) of CFB Trenton since 2006. He volunteers with his old military unit as a guest presenter on the History of the CF Postal Service to new Officers and Apprentices entering into the postal service. He is married to Marion, his spouse of 47 years and has four children, William a CPO2 at NDHQ Ottawa, Charles a Sub Lieutenant at NDHQ Ottawa, Dana a student at Fraser University in Abbotsford, BC and Tegan who resides in Kingston, Ontario. He has six grandchildren. He is committed to fill his new role as Senator of MNOVC to the best of his ability and represent the interests of all Métis Veterans in the Metis Nation of Ontario. Greg Garratt is from Penetanguishene, Ontario. He joined the Navy in 1981 and was stationed in Halifax till discharged in 1989. He moved back to his home town, where over the past 28 years I have been active in many organizations. His wife Heather of 24 years is also Métis and together we do what we can for our citizens, from refurbishing computers for those without to attending and volunteering at our community assembly, parade's etc. He sits or has been active on several committees from Downtown development, our Local Organizing committee for the 2013 Ontario Heritage conference and 400 year commemorative Champlain Committee, his union (SEIU) as a board member and several sub-committee's throughout. He continues to maintain status as a reserve with our Armed Forces. As well as being Region 7 Captain of the Hunt since 2013. Both Greg and his wife trace their Métis heritage to Drummond Island and find so much has opened up since stepping up and getting more involved with the Métis community over the past 17 years. The step to accept the nomination for Secretary/Treasurer seemed to be natural next step to doing more in hopes of being able to help others and preserve and enrich a part of our past for the present and the future generations. With a personal goal to identify and seek out other Métis Veterans and work with other aboriginal veterans groups to ensure the sacrifices made to build this great country get acknowledged and the torch of remembrance is passed to the next generations, "Lest they forget". Greg was awarded the Suzanne-Rochon Burnett Volunteer of the Year award at the 2017 AGA in Kenora. Shelly Claus joined the Canadian Armed Forces in 1985 and attended the Basic Recruit training at CFB Cornwallis, Nova Scotia. She was 23 years old, the oldest women and the only married woman among 60 other women. In 1985-1986, Shelly took her trade training (TQ3) at the Canadian Forces School of Electronics and Communications, at CFB Kingston, Ontario. In 1986, she graduated as a Teletype Operator. Shelly was trained to transmit messages and signals throughout Canada and abroad. She was also trained to encrypt and decrypt messages. Shelly held a Top Secret security clearance given me special access to see sensitive information from all levels of military and the Canadian Government including the Prime Minister's office. In1986, she was posted to National Defense Headquarters, Ottawa, Ontario (764 Communications Squadron). In1990-1991, Shelly did a Six-month United Nation Peacekeeping tour Golan Heights. During this peacekeeping tour, the Gulf War began (Jan-Feb 1991). The Golan Heights is located on the Israel/Syrian border. The camp (Camp Ziouani) became a target due to its close proximity to Israel. During this time, there was always the fear of chemical attack. We (troops) made airtight bunkers, carried our gas masks and atropine needles everywhere we went. The scud alarms would sound at all hours of the day and night, which brought the camp to full alert. We all stopped what we were doing immediately and would don our gas masks and head to our shelters. At times, we would sit quiet with our gas masks on for hours before the "ALL CLEAR" would be ordered. We would then return to our regular duties. During one scud attack, the scud landed 20 kms from the camp. We made numerous evacuations to the airtight bunkers. Our tour ended in June 1991, all 200 hundred troops landed safely back in Canada. In1992, she was posted to CFB Calgary, Alberta (742 Communication Squadron). In 1994, she was posted to CFB Petawawa, Ontario (702 Communication Squadron). The MNOVC welcomes our new Women's Representative and her skills which will enhance the council. Brian Black joined the Canadian Armed Forces on January 25th 1990 and attended Basic Training at CFB Cornwallis, Nova Scotia. Later that year Brian completes his (TQ3) training at Black Rock in Canadian Forces Fleet School at CFB Esquimalt.Brian Graduated as a Navel Electronic Senor Operator (EW/FC)(MOC 276). Brian was posted to his first ship HMCS Kootenay. Quickly he completed his TQ4 qualification. On December 24th 1990 on his first day back home for Christmas break Brian received a call from his Cox?n asking if he was available to be attached posted to HMCS Huron to go to the Persian Gulf. Brian returned to base on Boxing Day and sailed on January 4th for the Persian Gulf. This deployment was the first time a Canadian Navy vessel circumnavigated the globe since the Korean War. Upon returning to CFB Esquimalt Brian was transferred to HMCS Annapolis. In 1994 HMCS Annapolis was tasked to Operation Forward Action U.N. Peacekeeping off the coast of Haiti. Shortly after this deployment Brian resigned from the Canadian Forces and began a corporate career that involved, Labour Relations, Supply Chain Security, Cargo Customs Inspections, Natural Resources. Brian has always remained active in the communities he has lived in, working in coaching minor sports, working with OPP Victim Services, and recently serving on the Board of Directors for a Private School. Brian can trace his Metis heritage back to the 1750?s in York Factory where his 6th Great Grandfather married a Cree woman in York Factory. Brian looks forward to serving our Metis Veteran Council to the best of his abilities and with the highest level of integrity and to support and raise awareness of the service our Metis Brothers and Sisters provided our great country. Doug was born and raised in Midland Ontario. would last several days if the wind kicked up. was a natural progression that he became a soldier. and Gagetown, he specialized as a Tank Gunner. traveling all across Ontario, and beyond for 34 years. member of the Georgian Bay Hunters and Anglers Club. He is now married to his lovely wife Monique. days in his boat pursuing "the big one". the cold, and " living the dream". a new found passion, and a desire to stay connected to his Military past. Please contact the the MNOVC for the registration form. [email protected] You will be sent the forms via email or you can copy and paste from the home page.